Winter calls for comfort food, foods that warm your cockles and hugs you from the inside. If you follow me on Instagram you’ll know that I have fallen in love with my new pressure cooker. It’s such a great gadget and I have made so much use of it due to its quick cooking times. Stews and curries have been a favourite to cook in it. 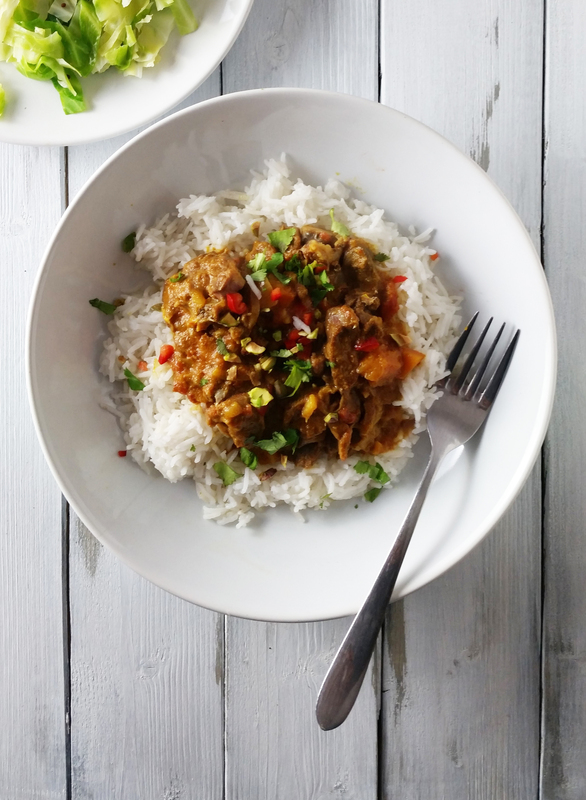 Here’s a super tasty African-style lamb and peanut stew. I used lamb neck for this recipe for a deep, rich, meaty flavour and cooks in a quarter of the time in the pressure cooker, than on a conventional hob. Handful of roughly chopped peanuts. Step 1 If you have an electric pressure cooker set to browning function, add oil in the base and fry the onion, carrot and garlic for 3 minutes, then add the lamb and continue to fry for further 3 minutes or until the lamb is brown on all sides. Step 2 Add all the other ingredients to the base, cover with the lid and pressure cook (with the valve closed) for 45 minutes. Step 3 Once cooked serve with basmati rice and garnish with a sprinkle of coriander, chilli and peanuts.